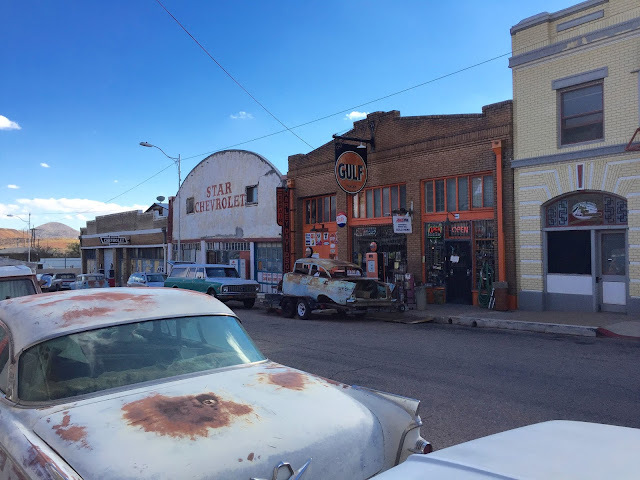 A day trip while staying in Benson was to the town of Bisbee, a mining town founded in the late 1900's. 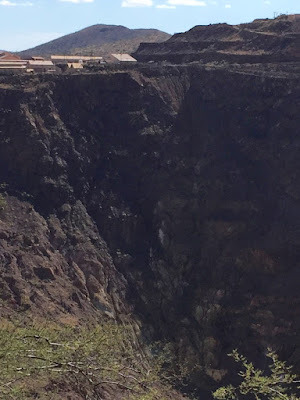 Copper, gold and silver were mined in this area. 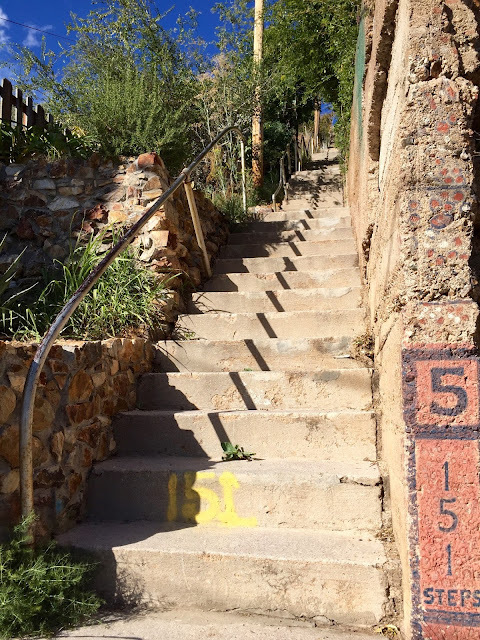 After mining operations ceased in 1975 Bisbee became a popular place for artists and tourists. this is a 2-way street. Each year Bisbee has a running race/stair climb called the Bisbee 1000. The race includes a total of 1,034 stairs spread over 9 different stair cases. We got a workout just sight seeing in this town. Stair rails between the green house and corner of white deck lead upward to the level above where you can see the deck of another house. The town is a maze of stairs. There are houses on both sides of this staircase, also a house on top which is the next street level up. 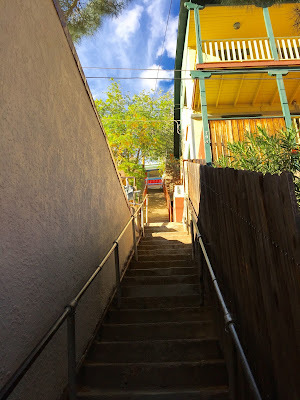 When looking for a lunch spot and checking reviews, a diner called the Bisbee Breakfast Club was our choice, “good food, reasonable, a favorite of locals” and just a couple miles from down town Bisbee. We plugged the address into our GPS and low and behold we ended up in this strange looking neighborhood. It was as if we were morphed back into the 1950’s. 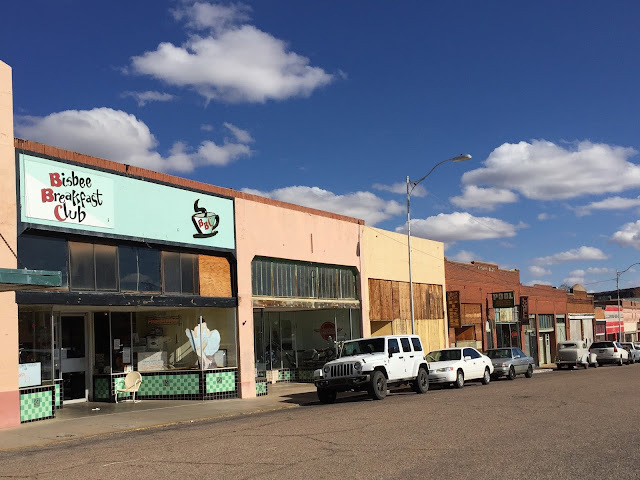 The street, only a couple blocks long, seemed frozen in time and deserted…old buildings, cars and stores closed up. The once open-pit copper mine (over 800 ft deep and 5,000 ft long) is directly behind this street. We looked around somewhat bewildered, thinking our GPS was craaazzzy. Then we spotted the Bisbee Breakfast Club at the end of the block. The outside didn’t look like much, but it seemed busy, the inside was a nice surprise. The decor was eclectic, modern and clean, as were the patrons. Much different than the outside appearance. Food was very good, yeah for Trip Advisor reviews. 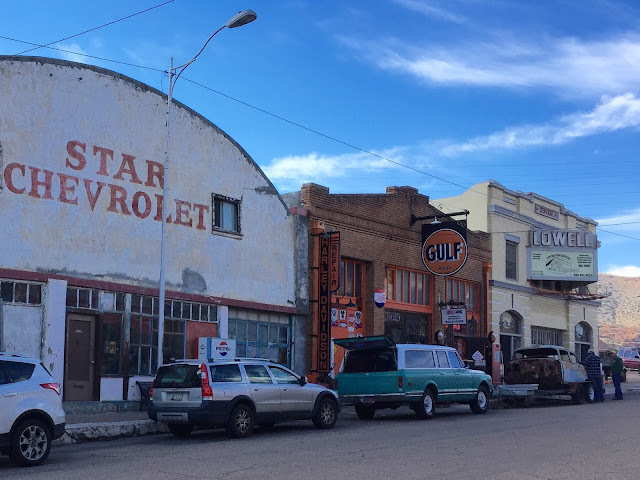 After doing some research we learned Lowell was once a mining town bordering Bisbee. Most the original town site was consumed by the excavation of the open-pit copper mine. Many houses were moved or torn down. All that’s left of downtown Lowell is the few blocks of Erie Street. Now that I know more of the history, I’d like to go back again, it was a great place for photography, not knowing any of the history beforehand, our first impression of Erie street was frankly little “eerie”. This picture isn't the greatest, however, I think interesting. The buildings in the background sit on the edge of the large open pit copper mine which closed in the 1970's. The old town of Lowell, where we found our diner sits behind the buildings. 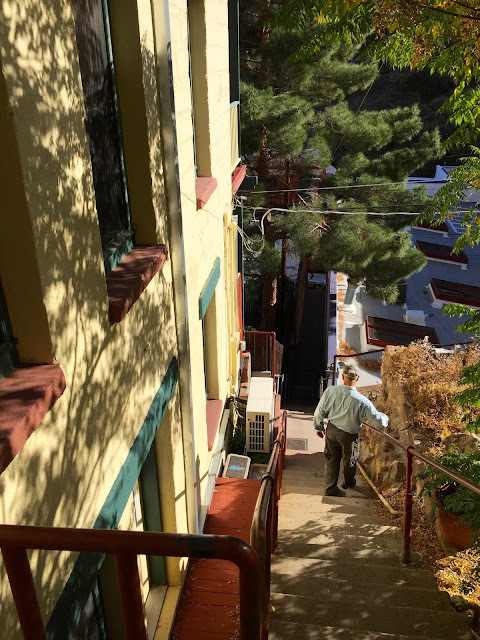 That's all from Bisbee...a great place to visit. A view of the Escapees park we stayed at while in Benson. Escapees is a club made up of RV people, we joined Escapees about a year ago, a good move on our part. This Co-op park is managed and owned by the Escapee members that are lease holders in the park. It ranks high on our list with great amenities, activities and fun friendly people. We hope to return. 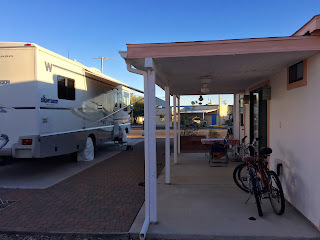 Our site had a cement pad for parking the RV and a casita (Spanish for small dwelling). We enjoyed having the patio to use. The lots in the park are all different, most have casitas decorated beautifully with nice landscaping. It was fun walking around just looking at all the creative things people did with their lots. 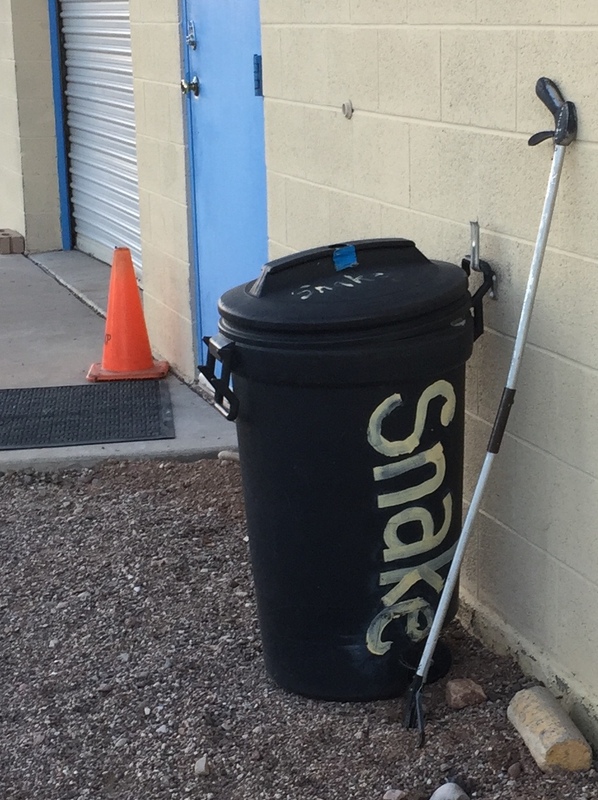 This is what you do if you have a snake at your site. I wondered who volunteered to take care of the "deposits". A visit to Tombstone...a short drive from Benson. Perhaps the most famous shootout in the history of the Wild West. The gunfight was the end result of a feud between a band of outlaw cowboys and the Earps. The Earps had been the target of repeated death threats because of their interference in the cowboy’s illegal activities. On an October afternoon in 1881 things came to a head and the gunfight went down in history. When the the smoke cleared, three of the outlaws were killed. 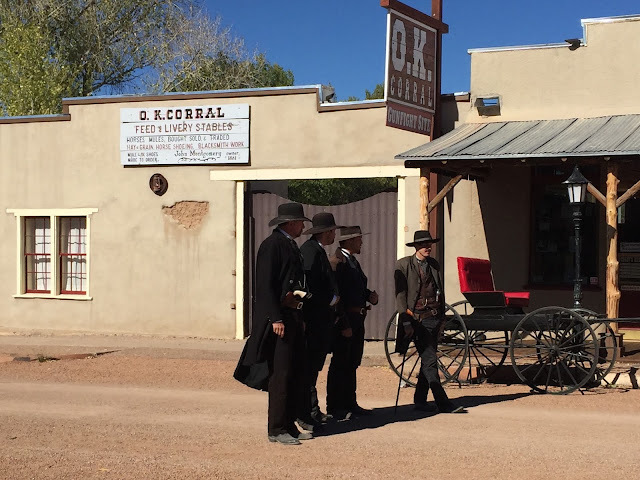 Doc Holiday, Virgil and Morgan Earp (the marshall) were wounded, Wyatt was unharmed. 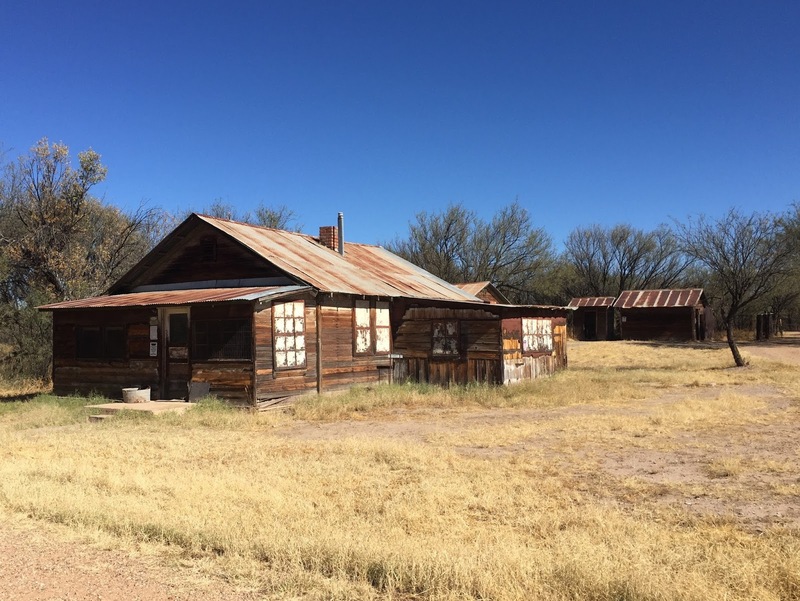 The ghost town of Fairbank. Fairbank was occupied from 1881-1973. It was founded during the Tombtone silver rush.Fairbank became a railroad hub and served as Tombstone’s train depot. Over the years, the town had a hotel, saloons, post office, school, businesses and a stagecoach stop. The train depot closed in 1966 at that point most the jobs in town also dried up. We were amazed to learn the Mercantile continued as a store, post office and gas station until 1972. When it finally closed…so did Fairbank. The Boquillas Ranch was a large cattle ranch near Fairbank that dates back well over 100 years. Now abandoned, the land was acquired in 1986 by the BLM (Bureau of Land Management). It’s now part of a large conservation area with wetlands and the San Pedro river running through it. 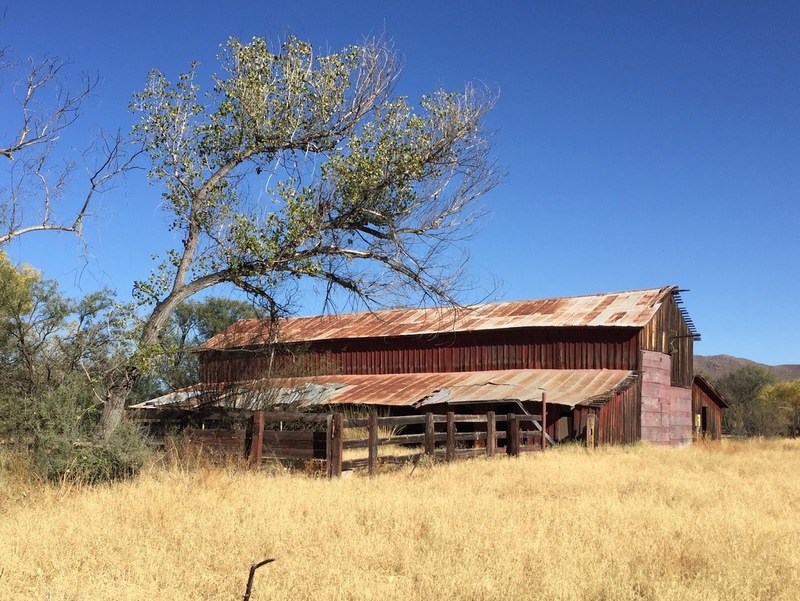 The 2 mile hike down an old dirt 2-track road revealed the old ranch. The dirt track is closed to motorized traffic but open to hikers and bikers. We were blown away when we reached the ranch, remains of what was once a large ranch stood quiet, in a tall grassy field, subcoming to age. The old weathered barn is much larger than we expected and more beautiful. The ranch house is boarded up. It was so peaceful here. How nice to explore with no vandelisim or grafetti in sight. It’s a ways off the beaten path and not much publized. A volunteer at the little schoolhouse museum told us about it when we asked about hiking. Feeding area in the barn. Old gas pump at the ranch. Another photo of the barn. I love old buildings and the weathered wood. I hope preservation of this ranch takes place, it’s so historic and beautiful. About a 40 minute drive from Benson is Tucson and the Saguaro National Park. The park consists of thousands of acres...full of saguaros and hiking trails. We love hiking in the desert and among the majestic saguaros. Before leaving Benson we visited Bisbee an old mining town...tune in for next blog on Bisbee.